A failure in cooling systems is one of the biggest causes of vehicle breakdowns, so it is highly recommended to have periodic radiator flushes and checks so you can eliminate any of these problems before they happen. Whilst driving, there is a massive amount of heat which is generated and cooled by the radiator system to the optimum running temperature, this is closely monitored by thermostats and pumps which all work together to control the flow of the coolant, problems arise when one or more of these components fail which can cause a major meltdown of the whole cooling system.If your radiator is losing coolant or your temperature is constantly high you should have a radiator check as soon as possible as one problem in a cooling system can quickly lead to another. These can occur from the radiator itself or further along the cooling system where they can be harder to spot and harder to fix. Some of the parts associated with the cooling system and which could require repair, or replacement are as follows. ​Over time a radiator can accumulate a buildup of particles and debris, none of which is healthy for any of the components above, this debris can start to cause blockages and restricting coolant flow in the process, this can cause hot spots or even air blockages in the system, all of which stop the cooling system maintaining a normal operating temperature for the engine. Inspection of the whole radiator and coolant system for leaks, this may be in the form of a pressure test if levels are low for no apparent reason. Flush chemicals are added to the radiator cooling system, these will break down all the deposits which have formed inside and are restricting coolant flow. The fluids in the cooling system are drained and then the correct amounts of coolant and antifreeze are added back to the system, the engine would be run at this point to re-check for leaks and allow the levels to adjust so they can be corrected. Although some of the problems can be simple, it is highly recommended not to run your car for too long, if you have either a coolant leak or the temperature gauge is constantly high. 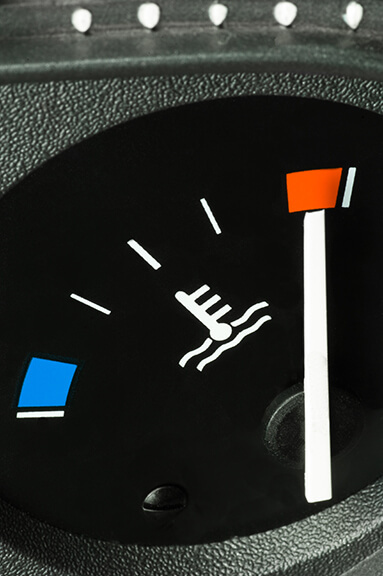 The problems caused by an overheated engine can be drastic in the long run.